Roberto Di Matteo has signed a new contract at Chelsea, and will stay coach of Eden Hazard for 2 more years. Eden Hazard officially presented by Chelsea! 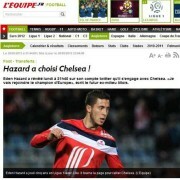 Almost a week after announcing he his decision, Eden Hazard was officially confirmed and presented.